I remember the first time I used an automatic teller machine, my perplexed brain thought there was an element of magic involved. I had just received my first ATM card, and my mom walked me through the process. I swiped my card, and put it in my pocket. The idea of having a secret PIN was thrilling and after putting that in and going through the remaining options and then withdrawing cash in a multiple of 20, there was the wait for the cash. A message came on the screen about home loan financing, and the ATM sang a little song and spit out the cash and my receipt came out. There was no slot for me to get my card back. How do I get my card back? “It’s in your pocket,” my mom said. And for a moment I truly believed the ATM had magically slid the card into my wallet. I quickly realized I put it there, but the wonder of the ATM was permanently instilled in my brain. 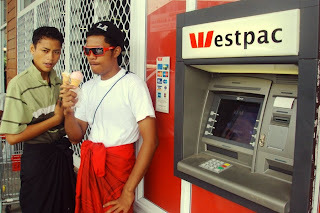 In Samoa there seems to be a similar attitude of fascination and mysteriousness toward the ATM. Only a small segment of the population works with computers and other automated machines on a regular basis, so there can be some confusion, particularly at certain banks where the ATMs only speak English. Using the ATM at least somewhat frequently. Many people opt for choice #1, but choice #2 is still able to generate busy times during which the crowd waiting for an ATM grows a little large. Choice #2 also means that it’s not uncommon for a machine to run out of cash. There was one weekend about 6 months ago—maybe it was Easter?—where by Sunday night all the ATMs in Apia had run out of cash. I was fine sitting at home eating peanut butter and jelly, but two volunteers who were in town and without means of cooking their own food nor buying food with cash they didn’t have were SOL. Without a kitchen nor an ATM (they burned part of their remaining cash taking a taxi to the outskirts of town, only to find the ATM there out of cash as well), they scrimped together their change, bought some bread and cheese, and called to ask if they could use my kitchen. I agreed. During the tsunami evacuation following the Vanuatu quakes, Koa and I found ourselves at the ANZ ATM up the hill. It was out of cash. There’s little sense of ATM etiquette here. Whereas when someone uses an ATM in the States, we all treat the person like he/she smells awful and give that person a 15-foot radius of privacy, people here have no problem sidling up next to an ATM user. The line for the ATM often forms directly behind th person using the machine. There’s no rear-view mirror or security camera, which seems unsettling at first, but theft of that sort is pretty unheard of here. Also, people often use the machine in pairs or small groups. 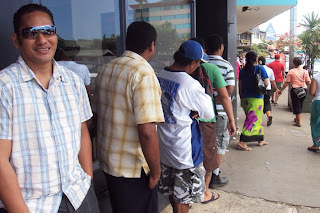 ATMs are popping up more often as Samoa continues to develop. And you can now use your ATM card to buy groceries. Wild. Tomorrow’s Cultural Exploration: White Sunday. Long line at the ATM. 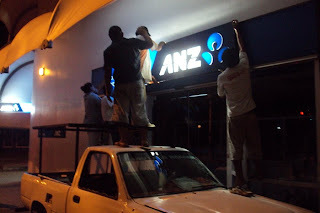 Workers changing the sign at the ANZ Bank on Beach Road.